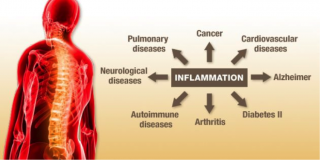 How is Inflammation Affecting Your Body? Take Care of It Now! Do you rarely feel 100% well? You’re not sick, nothing seems to be wrong, but you feel tired, sluggish and sore. Maybe there’s an area of your body that doesn’t seem to heal though you’ve rested, applied hot/cold, been careful. This silent malaise may be chronic inflammation. Not all inflammation is bad. Acute inflammation occurs when the body is injured (like a cut). The area gets swollen, red and feels tender. This is your immune system attacking the injury to start the healing process. We need this kind of inflammation. Chronic inflammation, however, is another story. When your body is trying to respond to all the crap thrown at it (e.g., pollution, poor diet and stress), the immune system can’t keep up and starts attacking everything, including the good cells in your body. Most of the triggers of chronic inflammation are controllable and can be avoided. Here are the top common causes. Poor food choices such as sugary drinks, unhealthy fats, processed food, excess alcohol and factory-farmed meats, are a HUGE cause of inflammation. Your body was not meant to digest all the chemicals and “faux” food available today. Yes, it’s convenient, but at what expense? Switch to organic fruits and vegetables, free-range and antibiotic-free meats, give up the sugar and drink in moderation. Nothing new in this advice. Related to diet, food allergies and sensitivities contribute to chronic inflammation even more than environmental pollution. Ingredients like soy, wheat and dairy can cause issues with skin, joints, energy and digestion. Eliminating them from your diet could help you determine if they’re the cause of your inflammation. Chemicals and toxins are the third big offender when it comes to chronic inflammation. Pretty much everything with which you come in contact has some sort of toxin in it. Air pollution (indoors and out), personal care products, household cleaners, furniture and clothing fabrics, the water you drink–all of these have chemicals that can increase inflammation. It’s impossible to eliminate all toxins from your life so focus on reducing the quantity. Choose products that have natural, less toxic ingredients, filter your water and read labels, learning which chemicals to avoid. Making small changes now could mean the difference between surviving and thriving. Reducing chronic inflammation is an important step to feeling better, being healthier and enabling the immune system to work as it should.